A little luxury in my life is a good coffee. The aroma of a freshly brewed coffee when you are camping, is a big highlight. Some cold mornings, sitting around a campfire, with a cup in hand, is a great and very relaxing way to start your day. Or if you have done a hike, then sitting back, admiring the view whilst you rest is also highly satisfying with a cuppa. Life is too short to drink that over processed poor-excuse for a coffee (AKA instant coffee such as International Roast or Nescafe). Even when heading outdoors, there is no need to resort to drinking instant. There is always an option to get a good brew, wherever you are, however you camp. Always. Now, some of you might be saying “I love International Roast coffee”. So taste is very personal. But that sort of coffee, just isn’t coffee as far as I’m concerned. I am not sure what it is, but it’s not a drink I want to wake up to. And those flavored coffees like “Fat Free Butter Rum” instant coffee…what plant grows something like that? 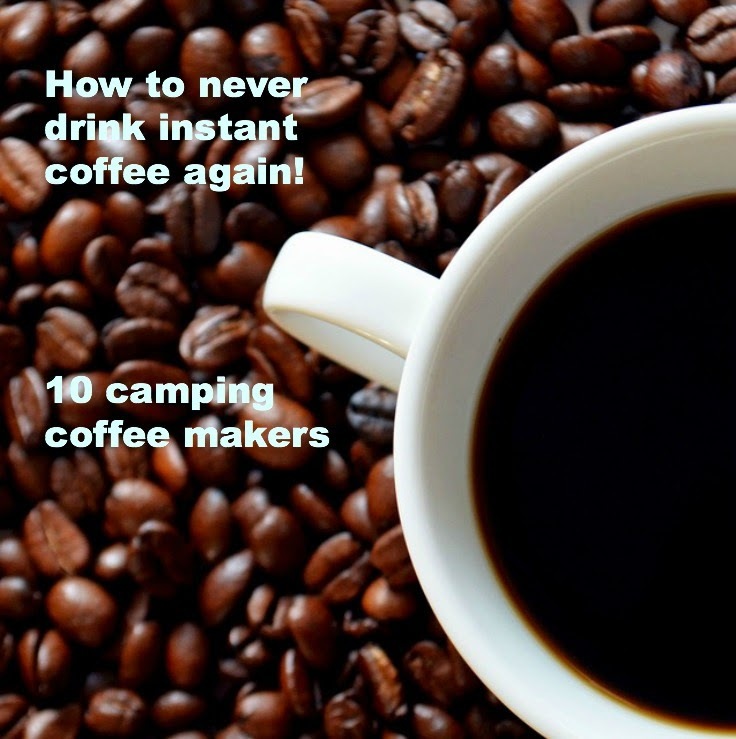 But how to get that perfect blend when camping? How not to resort to dodgy flavored coffees? Many campers have their preferred way of getting a good coffee. We love the Aeropress (you can read our review of the Aeropress here, and find out how it works). Why do we like the Aeropress? Because of its simplicity and the end result, which is a great coffee. But what else is out there, apart from the classic enamel kettles on the campfire? Or the percolators and French Presses? Well, you will be overwhelmed for choice in your quest to find a coffee maker that suits you. From the basic to the fancy hi-tech, from the cheap to the pricey, there really is a coffee maker for everyone. 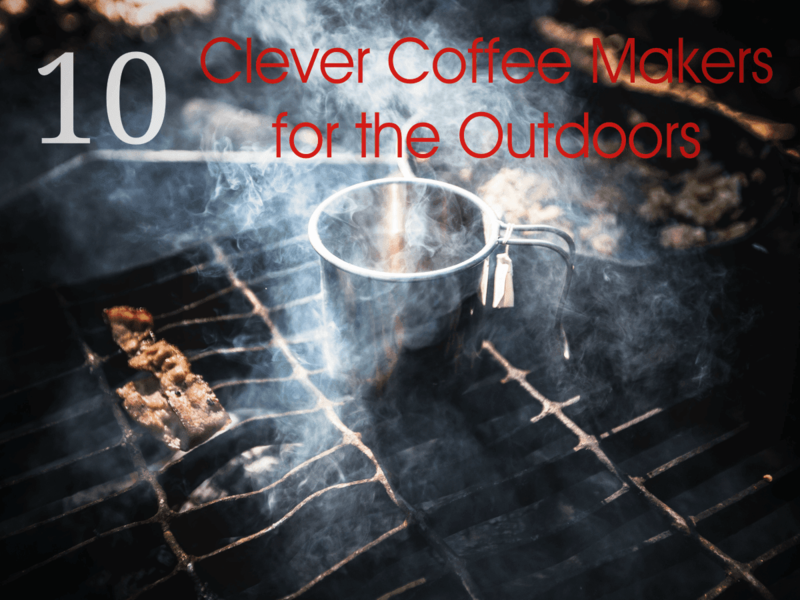 To give you some ideas, we have collated 10 innovative ways to get your coffee when you go camping. We have only tried a couple of these, but if you have tried any of them, leave a comment at the bottom and give us your thoughts. 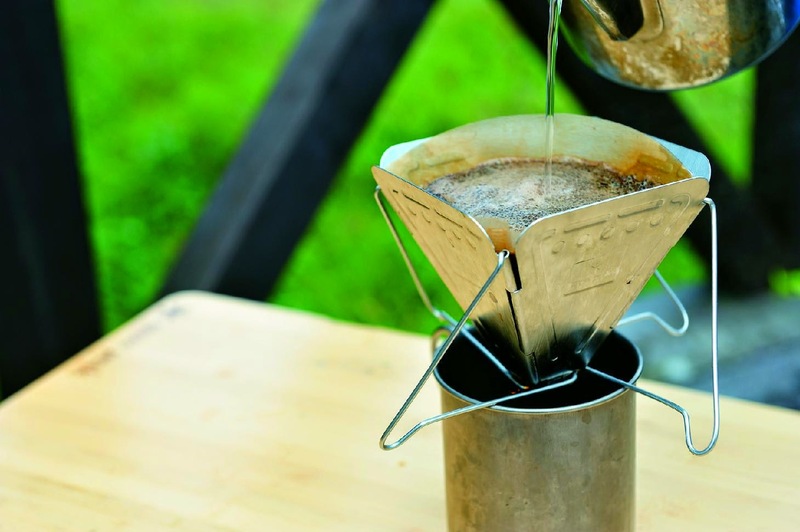 UPDATE: Camping Coffee Makers - Part 2 is available to read now. 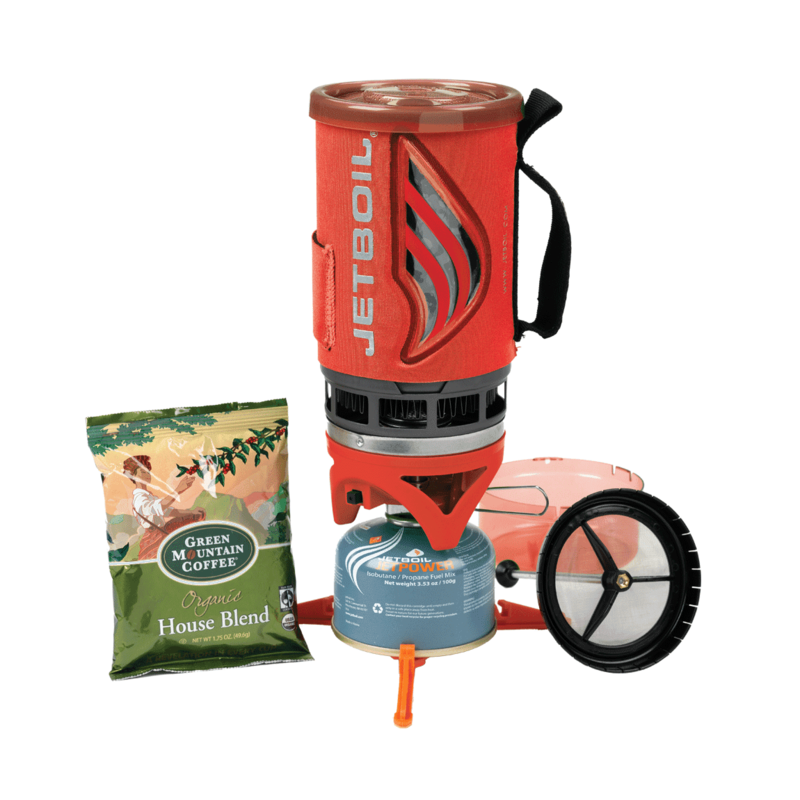 The JetBoil has been around for years, and there seems to be something new coming out frequently to complement or add to the JetBoil. This was one of our first purchases for getting hot water for coffee on-the-go a few years ago, and it remains a reliable method (albeit a little bulky) way to get a coffee. If you own a JetBoil but not the coffee press, you can purchase the coffee attachment separately and turn your JetBoil into a coffee maker (coffee ready in 2 minutes). 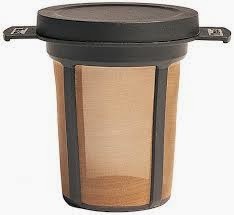 Or, if you are new to JetBoil products, they sell the entire kit including the coffee filter in one package (as pictured below). Note, the coffee press only works with some Jetboils that are 104mm in diameter, so check before purchase. The quality of the coffee, will depend on the sort of ground coffee you use and how long you let it steep. When we use it, I do find that some coffee grinds do escape into the cup, which is not very pleasant. Cost & Availability: Varies greatly, so shop around and look for specials. The entire package generally is around $100-109 in Australia and coffee filter as a separate purchase should retail around US$15, but here in Australia, they seem to charge $40 for it – try to buy from overseas with cheap shipping. 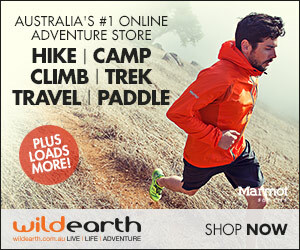 Try Wild Earth (affiliate) for specials on this brand. What sort of camper would this suit? : Anyone who is not concerned about weight or size. Suitable for day trip hiking, but if you are looking for a light load, then investigate other coffee options. The beauty of this coffee maker for camping, is not only the simplicity but the price. The dripper seems to fit every average coffee cup you own, and add a filter to it, put in the ground coffee, and slowly pour the water over the surface of the dripper, to allow a slow but even drip into your cup. It comes in ceramic and plastic, and readily available in Australia. What sort of camper would this suit? : Anyone looking for simplicity in their coffee making. And budget conscious campers will appreciate the pricing. 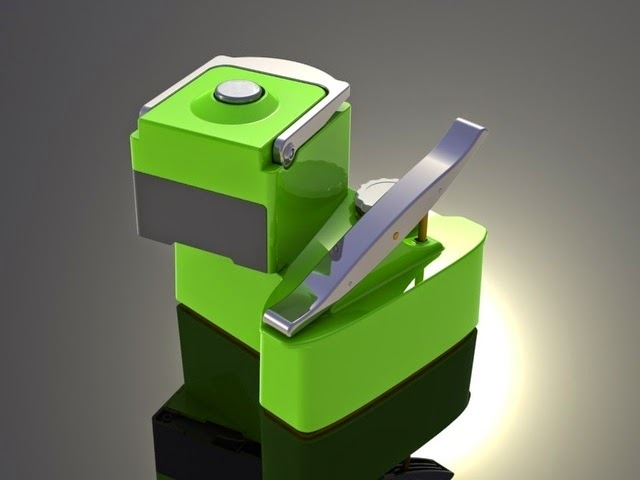 This coffee maker will appeal to some because the beauty is in its size and lightweight design. And of course, very simple too! The full review of the MSR Mugmate will explain in more detail, but its just a fine mesh cup where you add your coffee and then add hot water to it. 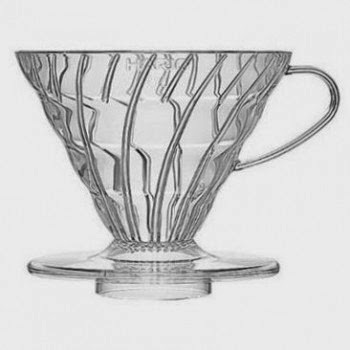 Designed for 1 cup at a time and for those of you who are looking for something that takes up no room, and doesn’t require filters (such as the Hario Dripper). Plus it works well with tea leaves and is targeted to both coffee and tea lovers. Cost & Availability: This one seems harder to get in Australia because of ridiculous shipping policies imposed by some outdoor manufacturers which restrict any retailer of their brand, from sending goods to Australia. If you want the goods, you need to buy from an Australian seller and pay the huge mark ups. MSR (which is Cascade Designs) is one such company which has those restrictions. Of course, the good news is that there is always a way around this, and purchasing from EBay or a UK seller allows you get the goods, and bypass this policy. The cost for the MSR Mugmate is around $16. What sort of camper would this suit? : Solo campers, where you don’t need to do a brew for anyone else but yourself. If weight and size is a consideration with your camping equipment, then you will appreciate this small and light coffee maker. The Ready Set Joe - This one reminds me of the Hario Dripper and has the same sort of coffee brewing method. It's a cone style method again, and takes standard filters (not specifically designed like the Hario). Made of plastic, it is light and would be a breeze to clean up! Cost & Availability: In the US, they retail for under $5 which is a bargain. Of course, bit trickier to get here, so EBay would be your best bet. Haven’t seen any Australian stores selling them, unlike the Hario (which apparently gives a better quality brew, and its available here, so that one could be your best option). Snow Peak Coffee Drip – this is one designed for those watching weight and space, as it folds down flat. Snow Peak makes some wonderful products, so quality is generally always excellent. Weighing in at around 113g, it may be too heavy for some backpackers who count every gram. Requires filters and a bit of practice to ensure the filter is placed correctly from what I have read about this method. Cost & Availability: Have seen advertised in Australia for $35 from Drifta Camping, Snow Peak also makes great titanium accessories like mugs, frothers etc. What sort of camper would these suit? : Campers looking for low mess with their coffee makers, and simplicity. No skill required to get this coffee. This is a very popular one, and a little more up market looking for your camping coffee. 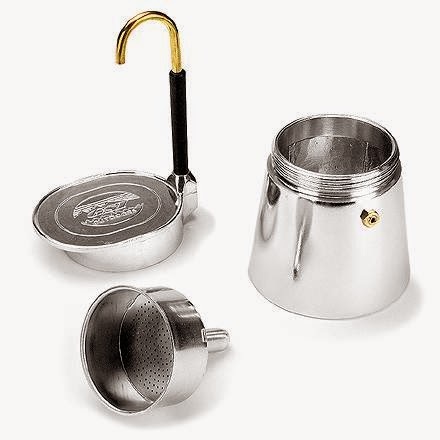 Used on a stovetop, this espresso maker gives you one double shot, in 90 seconds. It comes in a one cup or 4 cup design, so this larger capacity is useful if its not just you who needs that morning coffee, but the whole family. Plus, another benefit of a larger design is the ability to get your second cup rapidly, and not have to wait for the machine to cool down, clean and refill and then reheat. Cost & Availability: This is available in Australia, The 4 cup model will cost around $55-75 depending on where you purchase, so like anything, shop around. I have seen it online at Pinnacle Sports. 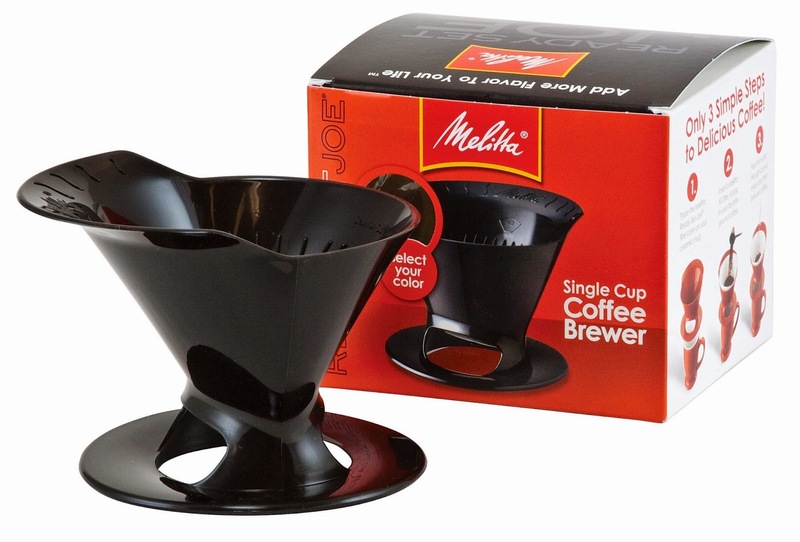 The one cup model is also available (try EBay) though there is not a huge price difference between the 1 cup and 4 cup models when purchasing from overseas. What sort of camper would this suit? : Campers who like their coffee with a bit more finesse than a pour over brew. 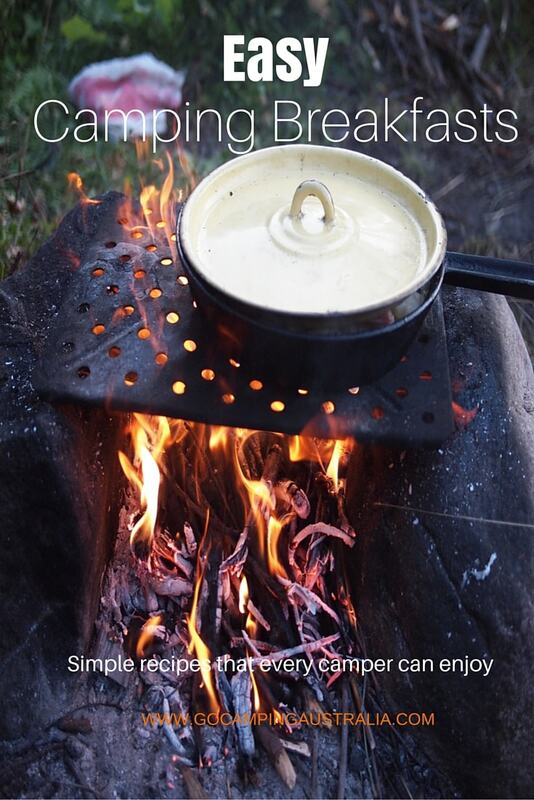 As it requires a stove to cook on, it would suit most campers who have that option. Frequently used by hikers on overnight trips due to its durability as well. Time to go seriously hi-tech looking with the Handpresso Wild Hybrid. It uses either ground coffee or an ESE pod (note: not to be confused with the capsules like Nespresso) and works by pumping the handheld unit up to 16 bars of pressure – like you would use a bike pump. Then add hot water to the reservoir and at the push of a button, the infusion of coffee into the water starts. Push the button again, and the infusion is over. The result is meant to be a pretty good espresso. I haven’t seen any of them in stores or heard much about them here in Australia, but from reports I have read, it seems like a great gadget to have in your camping box! Cost & Availability: This French company has only 1 supplier in Australia that I could find – Bombora. The site doesn’t give the cost either, but does show a huge range of extras available to use with the Handpresso. 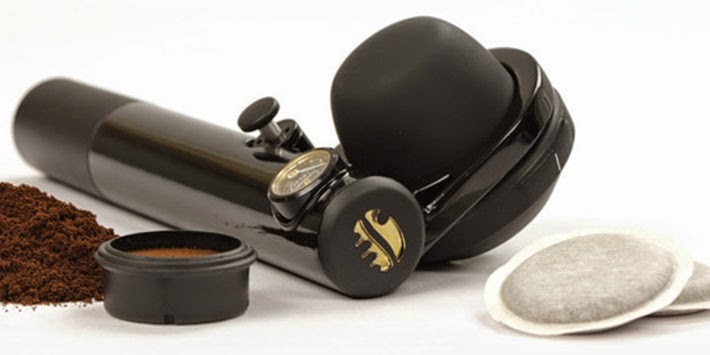 But on EBay, the Handpresso itself, seems to be around $120-150. When looking online, don’t get confused with the 12v Handpresso for the car which is around $250! What sort of camper would this suit? : Any camper who loves a good gadget (i.e.. us – so we may have to check this one out a lot more closely!! ), plus a camper looking for a good espresso delivered via pressure. This machine was the result of a Kickstarter Project to get funds to start the production of this machine. And it was so successful, its now available for purchase. So how does it work? The following is an excerpt from the the Kickstarter project for this machine, and explains it far better than I can. The Nomad was inspired by the classic hand operated lever machines which remain the benchmark of quality espresso machines. We simplified and miniaturized the large, complex lever machines and created a portable device that’s very easy to use. The Nomad is the size of a 15 cm cube, weighs 1.1 kg, and requires no electricity. With very little effort the Nomad produces 9 bars of pressure and like the classic lever machines users have direct control over the water temperature, pressure, flow rate, and volume. Skilled coffee hobbyists and experts will enjoy playing with these variables. In addition, The Nomad is equipped with a proprietary True Crema Valve™ which compensates for coarser grounds and tamping variations. When used with the True Crema Valve anyone can make great espresso and coffee without having expensive grinding equipment and extensive training. Cost & Availability: To purchase this item, is via online sale only at this time. You can do so here at Uniterra-Nomad.com. Cost, including delivery is $245. The aforementioned site can also provide you a great deal more detail on how this machine works. What sort of camper would this suit? : Campers who don’t want to leave home without guaranteed access to good coffee, delivered with a bit of style and innovation. 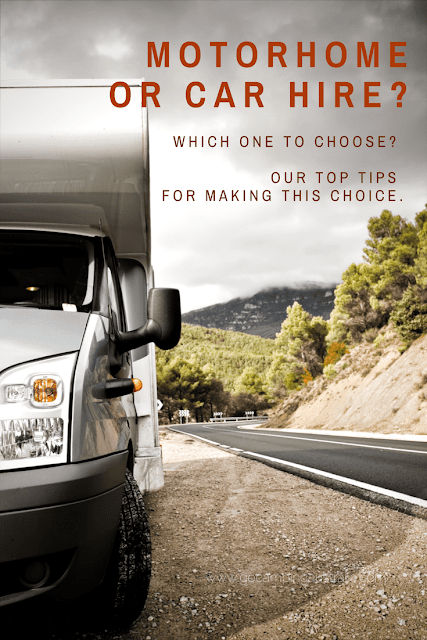 Plus campers who don’t need to worry about size, price and weight of their coffee machine, so campers with vehicles might find it a worthwhile investment! Also might look good on your kitchen bench at home. This coffee maker has been around for some time, and one of many products made by German company, Esbit. This coffee maker needs solid fuel tablets which might prove limiting if you can’t find any in your local camping store. The difference with this coffee maker and which sets it apart from the others already mentioned is that it is on its own little stove. The process to get your brew is fill up the coffee pot with water, put in the grounds holder and put your grounds on top, screw the lid on, place it on the stove and ignite the solid fuel tablet. Put the coffee cup under the spout, and wait for the coffee to come out. It’s like many espresso makers, but the built in stove is the difference. Cost & Availability: Try online or via EBay. Haven’t seen it around very much otherwise though. Keep in mind that with some Australian online stores, they have to still ship it from overseas BEFORE you get it, so delivery time stretches out quite a bit. It might be faster to purchase outside of Australia, and skip the delays. What sort of camper would this suit? 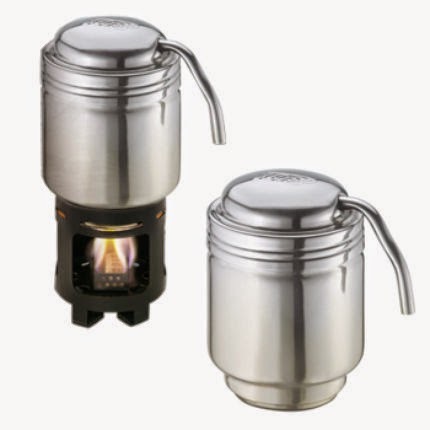 : Most campers, though once again, hikers might not like due to weight and size, especially if you are already bringing a stove along for your cooking, and then need this stove just for coffee. Now this one is for those who want to really impress everyone around the campsite. If coffee making was about good looks, then this machine might be the one that wins that category. I was sceptical that people would take this camping - but they do! I've read stories of people using it in the outdoors. This is from the makers of the Presso coffee maker (not covered in this story, but FYI it is a popular coffee maker), and is the new and updated version with a 10 year warranty. Wrap your hands around the polished aluminum handles. Feel the experience. You drive the finely engineered gearing that lowers the piston to generate the pressure to extract the coffee oils to create the perfect espresso. Wow. It’s enough to make me want to get one, based on that statement alone. The premise to the coffee is pretty much the same as a lot of the other coffee makers – add the ground coffee, tamp it down, add boiling water, and use the levers to build up pressure for extraction. A very similar way to how we use the Aerobie Aeropress actually……but the Rok has more of the “wow” factor in looks and price. Cost & Availability: This is readily available in Australia. 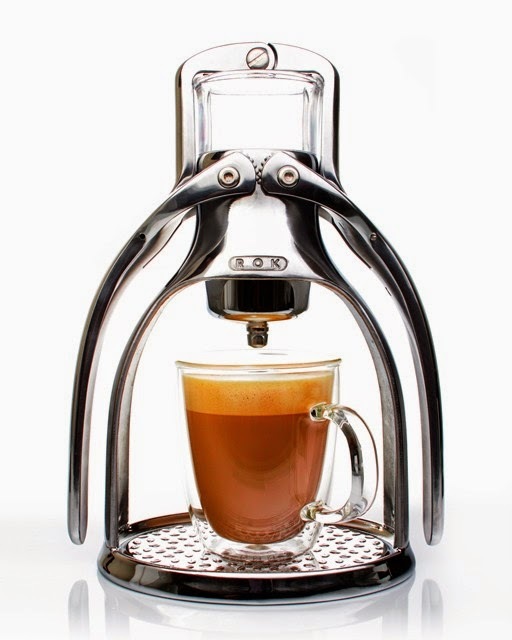 Try Espresso Unplugged and retail price is $199. Also available on EBay for similar pricing. What sort of camper would this suit? : Anyone who is truly serious about their coffee when outdoors. And has the means to afford and carry it to the campsite! How could we not include a cappuccino maker in the list? Nearly didn’t because they are not easy to find for camping. Yes, there are the separate gadgets that make the froth, but we wanted to find an all-in-one coffee maker. 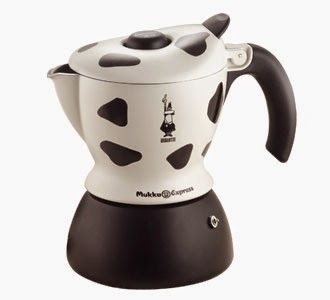 The Mukka by Bialetti is a derivative of the famous Moka Pot (cheap and reliable way to get a coffee from your stovetop!). The difference with the Mukka, is that you have a separate section for the milk and the pressure inside bubbles the milk, and empties into the cup.– serving 1 to 2 people. They come in the cute cow design or a more simple version – aluminum. It seems to have received very mixed reviews since its inception (cleaning of numerous parts apparently is a bit of a drag) and consequently harder to find. Cost & Availability: Genovese Coffee, here in Australia sells for $120. JetBlack Espresso has them priced at $139. And Typical Kitchen Store had them for $137. EBay sells them from $125 upwards. What sort of camper would this suit? : Cappuccino lovers, who need their frothy milk hit. As you can see, there is a huge range of ways to get your coffee when outdoors, and some of them aren’t cheap! Like any camping gear, it will all come down to your personal preference. For the coffee connoisseurs out there, you can rest assured that going outdoors doesn’t mean you need to be deprived of your favourite brew. There is bound to be one coffee maker in this list which will help your caffeine requirements in the wild. What is your favourite way to get coffee when outdoors? Leave a comment below. Note: All prices were correct at time of writing.